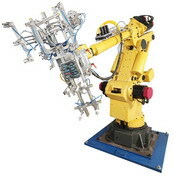 The company ELTRONIC Ltd. was established in 1993 from a group of engineers specializing in the field of electronics, automation, computer systems and technologies. The main activities are in “Development, supply and mounting of industrial automation and control systems; manufacturing of automation systems, control systems and other non-standard control systems; industrial electronic service and etc”. From 12th of January 2005 year the company is certificated by ISO 9100:2000 with certificated number: 166675. Warranty and after warranty service. For all service and activities The Company has all necessary equipment situated in the company sections in the cities Ruse and Sevlievo.